The RIBOPROTECT Hu-Mut is a genetically modified human placental RNase inhibitor expressed in Escherichia coli. The RIBOPROTECT Hu-Mut has significantly improved resistance to oxidation compared to the wild type human and porcine RNase inhibitors, and is stable at low DTT concentrations. It inhibits ribonuclease (RNase) activity of common eukaryotic enzymes such as RNase A, RNase B, RNase C by non-covalent binding in a 1:1 ratio. 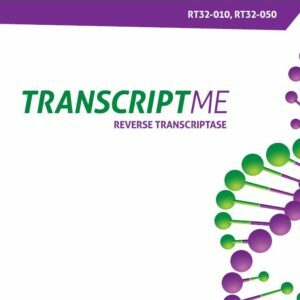 RIBOPROTECT Hu-Mut is compatible with DNA Polymerases and AMV or M-MuLV Reverse Transcriptases. The RIBOPROTECT Hu-Mut is a genetically modified human placental RNase inhibitor expressed in Escherichia coli. The RIBOPROTECT Hu-Mut has significantly improved resistance to oxidation compared to the wild type human and porcine RNase inhibitors, and is stable at low DTT concentrations. This makes it ideal for reactions where high DTT should be avoided (eg. RT-qPCR). It inhibits ribonuclease (RNase) activity of common eukaryotic enzymes such as RNase A, RNase B, RNase C by non-covalent binding in a 1:1 ratio. 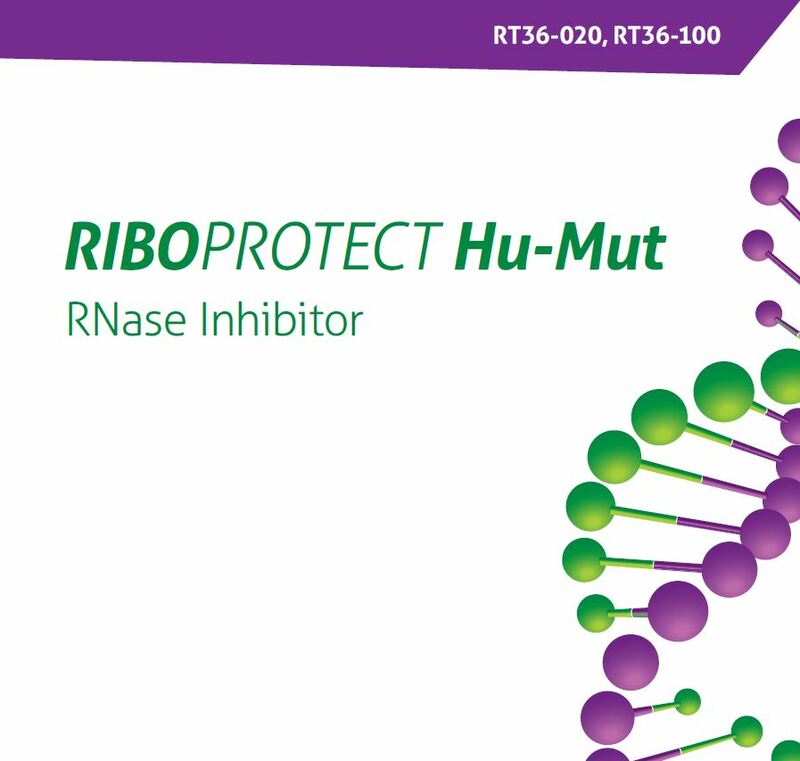 RIBOPROTECT Hu-Mut is intended for use in applications where the presence of RNases may cause a hazard to RNA quality and experiment results, e.g. in RNA isolation, cDNA synthesis, RT-PCR, in vitro transcription and translation, or RNase-free monoclonal antibody preparation. RIBOPROTECT Hu-Mut shows no activity towards RNase 1, RNase T1, RNase T2, S1 nuclease and RNase H. It is compatible with DNA Polymerases and AMV or M-MuLV Reverse Transcriptases. The optimal final concentration of the RIBOPROTECT Hu-Mut in a reaction depends on the level of RNase contamination, the incubation time and the compounds present in the reaction mixture. It falls within a range of 1 – 2 U/μl. For a standard reverse transcription reaction, use 1 μl (40 U) of the RIBOPROTECT Hu-Mut for a final sample volume of 20 μl. You may use higher concentrations of RIBOPROTECT Hu-Mut in RT-PCR if you suspect that RNase contamination causes certain samples to be difficult to amplify. The RNase inhibitor does not interfere with RT-PCR and RT-qPCR. 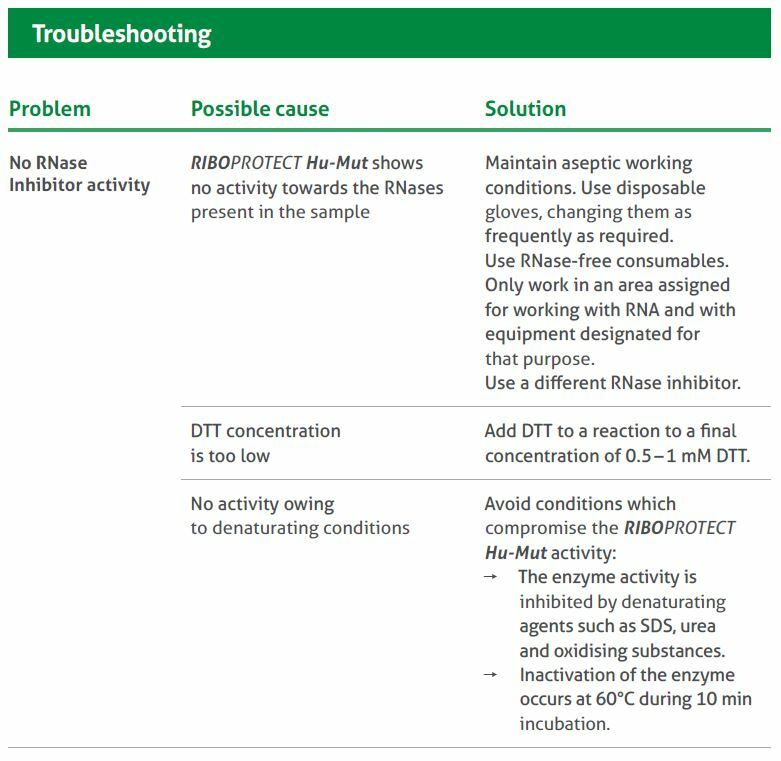 During assembly of a reaction, RIBOPROTECT Hu-Mut should be added before other components that are possible sources of RNase contamination. Using RIBOPROTECT Hu-Mut does not exclude RNase H treatment after amplification of the first strand cDNA.